In his bid to join the Angels, former Cy Young winner and former Husky Tim Lincecum had a rehab start at Cheney Stadium, where he was knocked around a bit by the Rainiers. TACOMA — The Los Angeles Angels are counting on Tim Lincecum to bolster their injury-riddled pitching staff. Lincecum showed signs of being able to accomplish just that despite a disastrous first inning in his season debut Thursday night with the Angels’ Salt Lake affiliate in the Pacific Coast League. Lincecum, a two-time Cy Young Award winner out of the University of Washington and Renton’s Liberty High School, loaded the bases and balked in a run before retiring a batter. The Tacoma Rainiers produced two runs on two hits in the first inning, and a leadoff walk in the second inning led to a third run for the Rainiers, the Class AAA farm club of the Seattle Mariners. After falling behind 3-0, Lincecum gave up a one-out single in the second inning, then retired 10 consecutive batters before issuing a walk and hitting a batter in the fifth inning. Lincecum completed the inning before leaving the game to mild applause from a crowd of 5,643 at Cheney Stadium. Lincecum’s line: Five innings, three runs, three hits, three walks, five strikeouts. He threw 88 pitches – 48 for strikes – and his fastball reached 91 mph. Lincecum took the loss in a 6-1 decision. 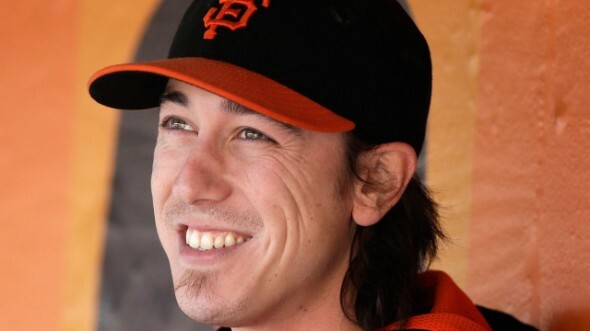 Lincecum, a nine-year veteran of the major leagues, said nerves played a factor in the rough first inning. Lincecum, who recently signed a one-year contract with the Angels for a reported $2 million after off-season hip surgery, is expected to start for Salt Lake Tuesday in Reno, then join the Angels for a June 12 home game against Cleveland. Tacoma manager Pat Listach said Lincecum looked the same as he did when Listach was coaching for the Chicago Cubs against Lincecum a few years ago. The Angels hope Lincecum can regain some of the magic that earned him National League Cy Young recognition in 2008 and ’09 with San Francisco. The 5-foot-11, 170-pound right-hander set career highs in 2008 with 18 wins (against five losses), 227 innings pitched and a league-leading 265 strikeouts. Lincecum’s ERA has topped 4.00 each of the past four seasons. Last year, he posted a 7-4 record and 4.13 ERA in 15 games (all starts) before undergoing the hip operation. Lincecum became a free agent last winter after the Giants elected not to retain him. Lincecum made $18 million in 2015. Linecum, who turns 32 June 15, said his body has not felt as good since 2011. “It feels great to be out there competing,” he said. Lincecum arrived in the majors in May 2007, less than a year after the Giants drafted him 10th overall out of Washington. A handful of family members and friends attended the game. IMO, Lincecum would have had a healthier, more successful MLB career fi he was eased into the majors instead of being rushed up. The MLB season is so much longer than in college you can’t just dive into it.